Ann Hazard is author of the books, Cooking With Baja Magic, Cartwheels in the Sand and Agave Sunsets, is a writer who is passionate about all things Mexican. Shes a third generation Baja Aficionada who has followed her father and grandfathers footsteps up and down the worlds longest peninsula since she was nine. She, her sister and parents flew in converted World War II cargo planes, landing on dirt roads in obscure places. The family also took to the roads (dirt, usually) in their camper and stayed at deserted beaches and in lush palm oases where they were the only gringos around. Since then, Ann has traveled throughout Mexico. While she enjoys the resorts, she has a strong affinity for the Mexican people and a deep abiding appreciation for the country, its history, culture, cuisine and geography. 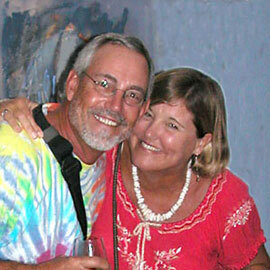 In October 2003 she and Terry sold their homes in the US and Baja norte and relocated to Buena Vista, Baja California Sur (between La Paz and Los Cabos) where they travel, write, shoot photos, swim, snorkel, kayak, play and entertain more houseguests than they could have ever imagined! A graduate of U.S. International University in San Diego, CA, Ann Hazard spent the first two decades of her career in human resources and corporate communications. In addition to writing, publishing and promoting her books, Agave Sunsets, Cooking With Baja Magic and Cartwheels in the Sand, she has also written about Mexico, raising kids and single parenting. The most comprehensive Baja California cookbook ever! This 240-page book contains 175 easy-to-prepare recipes in 15 categories, 20 from famous Baja restaurants. 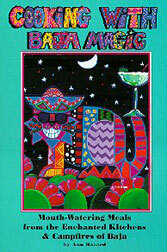 Try Confetti Dip Mardi Gras, Cabo's Restaurant Pancho's Tortilla Soup, "The" Original Tijuana Caesar Salad, Bay of L.A. Lobster Tacos, Expatriate Pepper Steak and Citrus Flan Extraordinaire from Caffe Todos Santos. A cookbook, storybook and art book all in one, it showcases 22 whimsical, colorful illustrations by Laguna Beach, California artist, Bob Bonn. Author Ann Hazard, a third generation Baja Aficionada guarantees that this book will inject you with a lasting dose of Baja Magic! "In fact," she says, "I promise it will tip your perspective slightly to the south, lighten your heart and transform your outlook on life!" "No faux-Mexican, Americanized recipes here -- Hazard's magic is la verdad comida, inspired by her family's extensive travels in Baja since the 1930's." -- Corinne Lynch, San Diego Magazine. 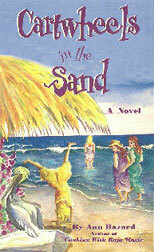 Cartwheels In The Sand is a story that will touch your heart. You'll laugh. You'll cry. You'll grind your teeth in frustration. You'll cheer. It's also a bona fide, user-friendly Baja California guidebook, complete with a travel index, map and detailed information for the occasional or avid ecotourist. You'll find out where to go, what to take and how to travel safely and sanely in Mexico. You'll also learn more about Baja's engrossing, unique history, geography and culture than you would ever learn in a lifetime of trips to the tourist hot spots like Tijuana, Rosarito, Ensenada and Cabo! as Ann leads you through the doorway into the second world. 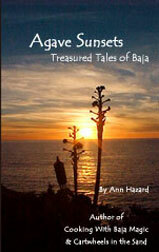 Agave Sunsets is a collection of 50 treasured Baja tales (each with a color photo) spanning four generations. It all began back in the 1890s with Anns grandfather, Pappy Hazarda notorious and lucky poker player who traveled Baja with Erle Stanley Gardnercreator of Perry Mason. For over 100 years, the Hazard family has adventured in Baja and the stories are recounted in Boys n Beer in Baja, and Fishing for Those Little Bastards, among others. Ann Hazard is passionate about all things Mexican. In addition to writing three books on Baja, she has published more than 100 articles about Mexico and written a divorce recovery book. Her work appears regularly in the San Diego Union-Tribune, the Coast News, Baja Tourist Guide and Baja Traveler Magazine. She has also written for the North County Times, Cedros Review Magazine, Discover Baja and for numerous Mexico websites, including MexGrocer.com and BajaPortal.com. She would love to share her adventures and insights, via further separate publication of these stories, interviews, by speaking to groups, teaching Mexican cooking lessons and by chatting informally one-on-one with adventure lovers on both sides of the border. Copyright © 2011 - Joseph A. Tyson - Tyson Promotions, Inc - All Rights Reserved. Los Cabos Magazine - Los Cabos Visitor's Guide - Promociones Tyson, S. A. de C. V.